We here at AirVuz — including AirVuz FPV team pilot Phluxy — teamed up with the Harlem Globetrotters to produce a unique video of the famous basketball tricksters performing part of their routine. 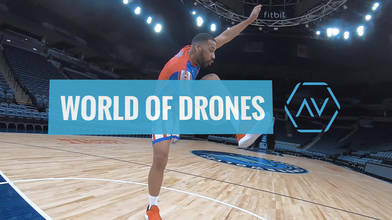 Using a racing drone, Phluxy filmed a single-shot take of the tricks to showcase the Globetrotters’ skill and personality. Stay tuned for a behind-the-scenes look at more footage from the shoot. In other drone news this week, drone manufacturer Skydio is in a bit of hot water after it was discovered that the company’s ad promoting its follow-me technology was shot in Yellowstone National Park. Flying a drone in national parks in the United States is illegal. The Instagram post by Skydio tagged the video’s location as Iceland, but several people noticed that it was indeed filmed at Yellowstone. On the other side of the world, a farmer has used the DJI Mavic Enterprise as a barking drone to help herd his sheep. While farmers have utilized drones for many purposes, this appears to be a new one. We’ll have a new Drone Video of the Week winner tomorrow. That pilot will take home $250. Stay tuned to AirVuz.com to hear who our latest winner is. If you have drone footage from a filming location of any of the James Bond movies, we’d love to see it. We’re working on a video collection of aerial footage from James Bond filming locations. If you’d like yours to be featured, upload it to AirVuz.com. We talked with SkyOp CEO Jon Thies about his company’s drone curriculum that they think could be a fit for any high school in the United States. Click here to see the full story. Koshmrl, Mike. “Y'stone Drone Ad Draws Fire.” Jackson Hole News&Guide, 20 Mar. 2019, www.jhnewsandguide.com/news/environmental/article_8c236a40-696c-58de-b4a0-91541f10b0f0.html?fbclid=IwAR28GPD7HxWfdubioS8eYKh97DLyEFKqmeSfeLK9SsMn23C2Q0ArOnzfrkk. “VIDEO: Farmers Find New Use for Drone: Herding Livestock.” AGDAILY, www.agdaily.com/video/farmers-drone-herding-livestock/.